What is an employee engagement application? There are numerous sources of established research on the importance of employee engagement: why it matters, how an engaged workforce leads to lower attrition rates, improved customer satisfaction, and better business revenue. 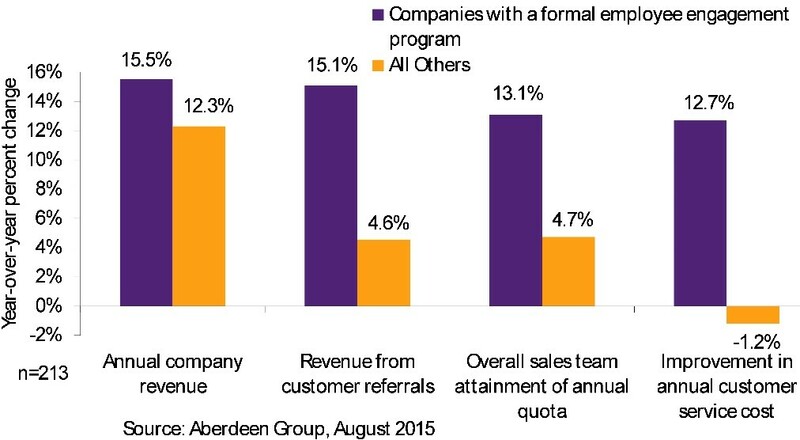 A Aberdeen research group provided the following insightful chart, clearly demonstrating the advantages of implementing a formal employee engagement program. But what about technologies that can help boost employee engagement? What mechanisms do they leverage to accomplish on the job motivation? And more importantly, are there applications available that are specifically designed for the contact center industry with its unique challenges? Among those challenges are a huge influx of Millennials who need to be engaged in new, innovative ways, high-attrition rates, a stressful work environment, and hard to find soft skills that include loads of patience, customer empathy, and the impeccable time-management abilities. By extension, it’s easy to understand how managing a contact center is just as challenging. A huge caseload of reports to generate, IT integration and maintenance, schedule management, staff coaching…the list goes on. An employee engagement solution should also make a manager’s workload lighter and more automated, by adding built-in reports, data analysis, and a better way to manage employee recognition and career development. Let’s run an analysis on some of the top challenges inherent to rolling out an engagement, or Employee eXperience (EX) program. “…an employee’s attitude toward the job’s importance and the company had the greatest impact on loyalty and customer service than all other employee factors combined.” (source: Ivey Business Journal). With that being the case, it’s crucial to get a level-set of the current level of engagement with your team. 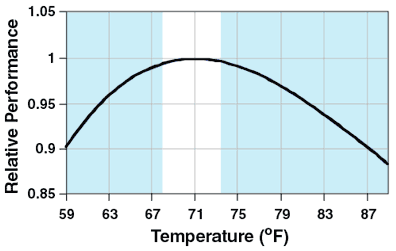 I like to compare this to using a thermometer for reading the temperature. Using surveys, polls, and analyzing performance trends are all valid methods for measuring employee engagement. Therefore, an employee engagement solution should provide one or several of these tools to gauge the level of engagement, or temperature, in your contact center. Measuring is only the first step, so before you consider a stand-alone survey tool to manage employee engagement, remember that you also need to have controls in place to adjust the dynamics – such as KPIs, and the right combination of metrics to boost performance. For instance, if your objective is to top-grade agents based on CSAT scores, you will need to have a way to guide them on that journey, and adjust for each staff member’s personality profile. Perhaps some of your agents are introverts, others social collaborators. Maybe you have some members of the contact center staff that are highly competitive. How about behavioral patterns? Do some agents perform better in the morning, then suffer a slight dip in their level of enthusiasm after midday? We all operate in a cyclical fashion, so it’s important to know when to put an agent on schedule, when to rotate them into knowledge-base research, or other related activities. If you don’t understand these behavioral tendencies, you can’t predict the best possible outcomes for each contributor on the team – making it nearly impossible to increase your operational efficiency and optimize schedules, breaks, and task assignments. Examine the list of features provided by each solution on your list. Do any of them mention the ability to act on the results of your engagement assessment? Consider how each solution gathers data, presents it back to you, the manager or administrator, and adds insight to that data. An employee engagement solution should also present solutions, not just measure performance. For instance, 2 members of your outbound sales team are starting to show a lack of enthusiasm in their work. Try using a contest for a performance bonus, based on KPIs that are meaningful to the department objectives, while leveraging their inherent skills. Instead of a whiteboard announcing a $500 bonus for the highest monthly sales, you should be able to send out a contest, and provide real-time updates, the ability for colleagues to encourage (think of a Facebook “like”) them, and publish the results based on metrics that everyone can see. This kind of fair play and collaborative dynamic provides what today’s new workforce demographic is always seeking: reinforcement, social engagement, and transparency into the process and outcome. A good employee engagement solution should provide the ability to create engagement across all agent personality types. Let me take this topic beyond the human motivation factor, and include data analysis; if you can’t effectively measure your results, how do you know your engagement program is working? Quantifying engagement can be done in several ways, the most attention-grabbing one being a reduction in human capital costs. That’s right: if your employee engagement initiative is headed in the right direction, you will experience a reduction in average staffing costs, a direct result of increased engagement. Motivated and focused agents perform better on their key metrics – metrics that are directly related to your bottom line. Schedule adherence, average hold time (AHT), customer effort, and Customer Satisfaction Score (CSAT) all have a positive effect on your repeat business, average customer spends, and profitability. Additionally, the behavioral patters that emerge from the before, during, and after phases of applying engagement principles need to be recorded, quantified, and accessible through reports or dashboards, for the benefit of the contact center manager. A strong contender on your short list of engagement applications will provide both standard reports, as well as predictive or forecasting capabilities to optimize how you staff your contact center. With AI and machine learning technologies blazing the way as the most innovative technologies for 2017. You should be able to narrow your list of engagement vendors down based on their use of behavioral and predictive algorithms in their technology stack. Next week we’re going to continue this post and come back with the Top 5 employee engagement solution requirements. In case you’re interested in a perfect way to gauge your contact centers engagement, have a look at the nGagement listing from nGuvu on AppFoundry here. This blog post has been co-authored with Jean-Marc Robillard. Jean-Marc Robillard is a technologist with over 15 years of experience in data analytics, workforce management, unified communications, and database security. He has held positions in product management and marketing at Oracle corp. and Kronos Systems, among others. He is currently the Director of Marketing at nGUVU, a Genesys partner and AppFoundry member providing gamification and machine learning solutions dedicated to employee engagement.